Here comes Halloween! It’s a favorite celebration in this house, perhaps emanating from a love of pumpkins and apples and celebrations by dark of night. My interest in Halloween lies in its old traditions. In some places, for instance, it was known as Nutcrack Night, for it was a night for roasting nuts and using them to predict the future. Halloween has long been associated with conjuring and magic, perhaps because of its connexions with things of mystery. Its purpose as All Hallow’s Eve is to usher in the Days of the Dead that follow: All Hallows or All Saints Day on the First of November; All Souls Day on the Second. We keep the dead in mind especially at this time of year, clear through to Martinmas on November 11th. One of the best things about Halloween, I think, is that everything is turned topsy turvy. The kids are out at night, ringing the doorbells of strangers, begging for treats. We wear costumes and masks so others don’t necessarily know our identities. And we carve lanterns out of pumpkins. How wonderful is that? That’s an old Celtic tradition, though back then and there in Ireland it was turnips that were carved. When the Irish began coming to America, pumpkins presented a great big orange glowing alternative. We’ve not gone back since. Each year for Halloween for, oh… many many years now, I’ve written a gently ghostly story and sent it out to the world via email. It’s the Convivio Dispatch for Halloween. This year’s Halloween Dispatch will go out tonight to subscribers of the Convivio Dispatch, which is a different animal from this blog. If you’d like to make sure you receive the Halloween Dispatch, please subscribe right here. And if you’d rather get just tonight’s Halloween Dispatch without subscribing, let me know in the comments below. Leave your email address and I’ll send it. Or email me directly at mail@conviviobookworks.com to say you’d like the story. But don’t be afraid to subscribe… those particular emails from me are very few and far between, and you’ll meet an interesting cast of characters from our home town of Lake Worth. Have a fine Halloween, filled with good spirit. We’re popping up at quite a few local South Florida venues in November! We’ll have a mini pop-up shop of traditional handmade goods for Day of the Dead made by our artisan friends in San Miguel de Allende, Mexico. We’ll be in the Craft Crypt at Huzienga Park on East Las Olas in our own tent with a pop-up shop of traditional Mexican handicrafts for Dia de los Muertos from 4 to 7:30 PM. Our favorite! Find us in the courtyard at Hatch with a pop-up shop of traditional Mexican handicrafts for Dia de los Muertos, Christmas, and everyday. We’ll be there for the full length of the celebration. We’ll be transitioning toward Christmas with a pop-up shop of traditional German advent calendars and advent candles from England, plus handmade Christmas ornaments and decorations from Germany and Mexico and our full line of Shaker herbs & teas and more. Plus there’s live music all day: Rio Peterson from 10 AM to 1 PM, Ella Herrera from 1 to 4 PM. It’s going to be a good one! 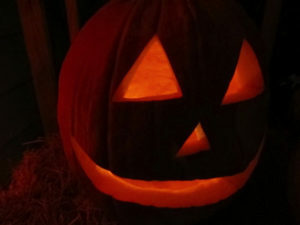 Image: One of last year’s Jack O’Lanterns, on the front porch. This one is by Seth. It’s got his trademark toothless smile. There is an old Jewish tradition of leaving rocks on gravestones––I think to mark your visit. 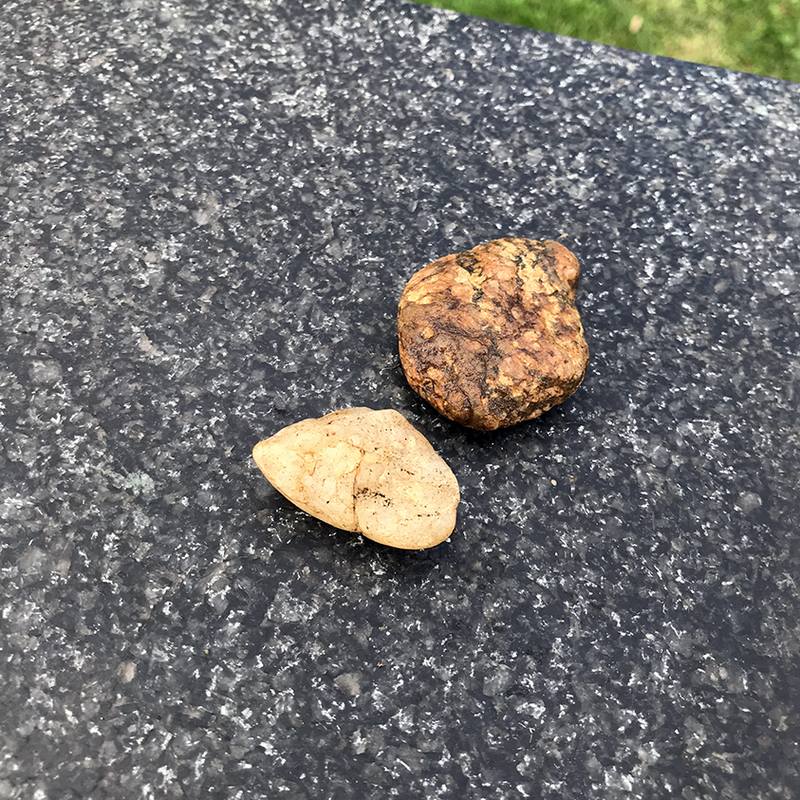 Seth and I left these two stones at the marker of my family’s plot in Westbury, New York, on Wednesday. It’s our first visit since my dad died in February, 2017. It was strange and sad at first, to sit there in the grass atop my father’s resting place. The cemetery was our first stop once we landed in New York, but then we got ourselves up, got a bite to eat at a diner where the chowder is Manhattan style (red, tomato based), and afterward we went to a garden center and picked up a small trowel and two celiosa plants blooming purple flowers and we returned to the cemetery with a project: I planted the flowers, one on the side where my dad is buried and one on the side where my grandparents are buried, and Seth began cleaning the stone. We didn’t have much with us to do that, but there was water nearby and I offered the toothbrush out of my backpack and so Seth brushed the green algae off the black granite stone, brushed the letters, brushed the carved image of St. Anthony of Padua, and it was good to have these projects. Dad, Grandma, Grandpa––they all appreciated things clean and orderly, and so I know this simple act of cleaning and planting would be appreciated, even now. Afterward, we lay there in the grass a long time, Seth and me… and then we set those stones atop the gravestone, said our goodbyes, and headed off to visit my cousin in Brooklyn (Brook-a-leen, as my Italian grandparents would have pronounced it). Our trips are usually like this: visits to family and friends, living and dead. The day before, I was at my mom’s house, mowing the lawn. I like this task. It is a job that reminds me of Dad, for it’s something we did together often. Many times this summer while I’ve been there tackling this job, riding the mower, thinking of Dad, a big wood stork would fly down from the heavens, land by the pond near the house, and there the bird would stand or sit, at the bank of the pond, under a tree, watching me. Large wading birds are not uncommon in the swampy lands near the family homestead, but to see a wood stork is rare. This one, though, he’s been coming around since July. We have our almost weekly visit together. If I get too close, the stork takes a few big steps away. He’s a good four feet tall, and so his stride is large. But I look at him lately and I wonder where he’s come from, and why he’s chosen to hang out at our pond. I’m glad he’s there. But that’s back home in Florida, which is not where we are now. Your Convivio Boys are on an autumnal jaunt, and if you know us, you know jaunts are not something we do often. First stop is New York, for just a few days, then onward to Maine. I’ll write when I can. I can’t remember not loving Halloween. The magic of it, the stories and specials on TV, the smell of the cabinet where we stored the hobo hat––all these things I remember from my earliest days and hold dear. And that may be why I look forward to autumn each year: the apples, the pumpkins, the particular slant of light of October. 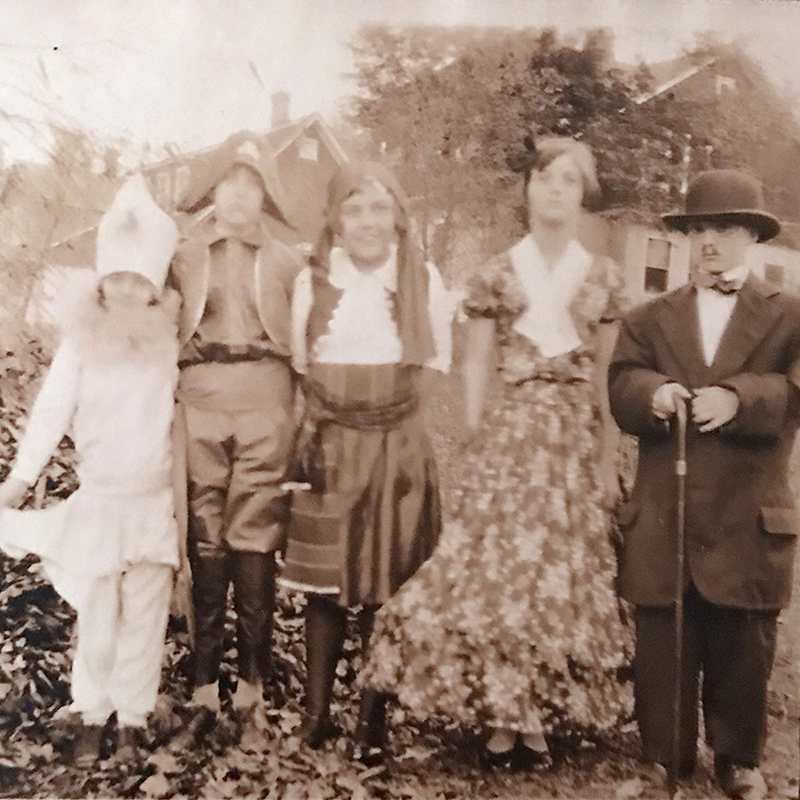 And while I have no idea who the kids are in this photograph, the one on the far right may just as well be me: If I wasn’t dressed as a hobo wearing that hobo hat we kept in the cabinet, most likely I was Charlie Chaplin. There were only a couple of years that I ventured away from those tried and true Halloween costumes. Whoever these kids are, they are your cover stars this October, welcoming you to your Convivio Book of Days Calendar for the month. The caption on the back of the photo is handwritten Hallowe’en Oct. 31, 1928, using the old spelling, the one with the apostrophe, the one more closely related to Halloween’s true name (All Hallow’s Eve), the one that helps us better remember the connexion of this magical night to the Days of the Dead that it ushers in each year: All Hallows on the First of November, All Souls on the Second, all the way to Martinmas on the 11th. These are the days known as I Morti in Italy, Dias de los Muertos in Mexico… the days when we remember all who have come and gone before us. In so doing, we keep them with us. And that is powerful magic indeed. This time of year, we’re here, there, and everywhere. Come see us at one or more of these events or sign up for one of our book arts workshops! We’ll have a mini pop-up shop of autumnal goods. We’ll be there with a mini pop-up shop of traditional handicrafts for Dia de los Muertos from Mexico. Pop-up shop of traditional Mexican handicrafts for Dia de los Muertos plus our full line of Shaker herbs & teas and more. Thursday evening October 25 from 5:30 to 8:30 PM, preregistration required. Sunday October 28 from 1 to 5 PM, preregistration required.